Glucose is a key energy source for all cells in our body. It is derived directly from the food we eat (digestion and absorption), and is also supplied by the liver - either by breakdown of glycogen stores (glycogenolysis) or synthesis of glucose using other building blocks (gluconeogenesis). Insulin causes skeletal muscle and lipid cells in our body to take up glucose from the blood. Another hormone, glucagon, counters the insulin function and facilitates glucose production during periods of starvation. Improper insulin function: Insulin binds to its receptor and initiates a cascade of signals in the cell, ultimately leading to the uptake of glucose. Missing or defective proteins in the signaling cascade (due to genetic defects or mutations) and/or changes in metabolites or signaling molecules (such as high levels of free fatty acids) may disturb the metabolic balance, leading to diabetes. Although regulating glucose and insulin levels is central to managing diabetes, the roles of lipids and various stress-induced molecules in causing diabetes are being actively studied. Some of the key causes of diabetes are summarized in Figure 1. Note the impacts of physical inactivity, and weight gain. Figure 1. 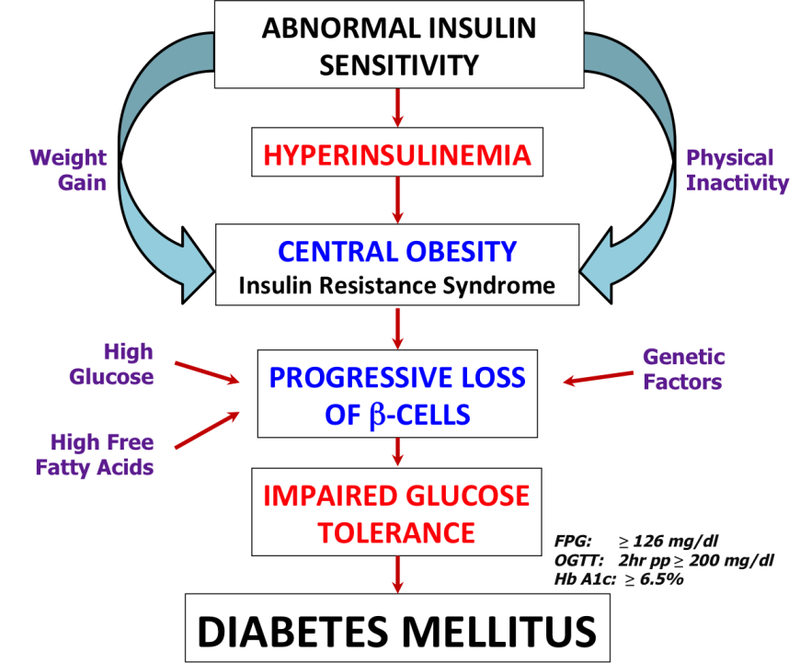 A flowchart showing the pathogenesis of diabetes mellitus. Some common risk factors are colored in purple, while the indicators for diabetes such as fasting plasma glucose (FPG), oral glucose tolerance test (OGTT) and hemoglobin A1C (Hb A1c) are listed in magenta. Through daily cycles of glucose intake (meals) and fasting (overnight sleep), the blood glucose level in normal individuals is maintained within a narrow range between 4 and 7 mM or 72 to 126 mg/dl (American Diabetes Association, 2009). This tight control is mainly mediated by two pancreatic hormones - insulin and glucagon. These two hormones also regulate each other's function - insulin inhibits hepatic glucose production while glucagon stimulates insulin production (Figure 2). Following a meal, when blood glucose levels rise, insulin is released by pancreatic β-cells. In liver cells insulin promotes glycogenesis, a process to convert excess glucose into glycogen for storage. 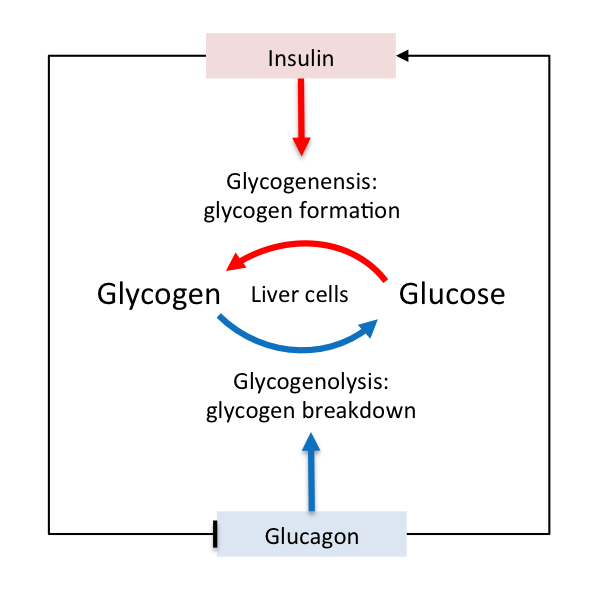 During periods of fasting, and in the presence of glucagon, stored glycogen can be converted back to glucose, by a process called glycogenolysis. Insulin increases glucose uptake in muscle and fat cells. Within these cells glucose enters glycolysis and provides energy. Insulin also supports lipid and protein synthesis and is responsible for promoting cell growth and proliferation. In fat cells glucose can be stored as lipids for long periods of time. In extreme starvation glucagon can mobilize these lipid stores for energy. 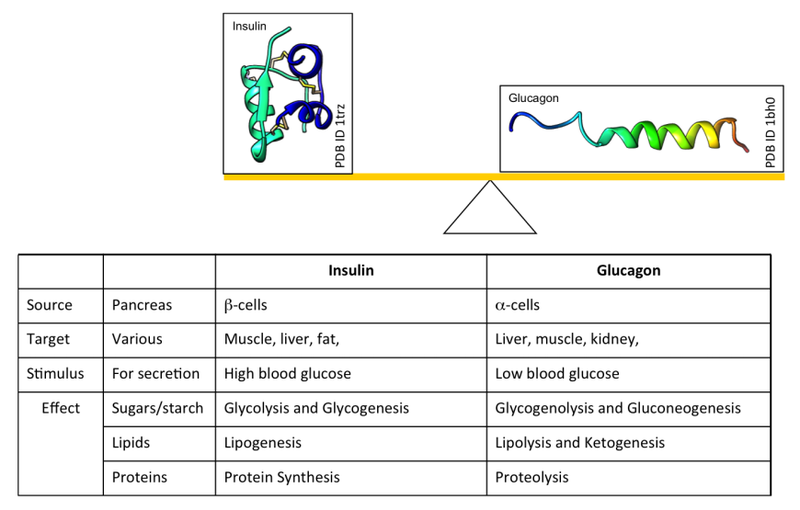 The interplay of all the processes regulated by the hormones insulin and glucagon is summarized in Figure 3.